I bought a Velleman PIC pogrammer kit a few weeks ago, assembled it right away, and programmed one of the examples from the CD on it, and left it gathering dust for a while. Apparently there is no free and uncrippled C compiler for the PIC16 series microcontrollers, except maybe for the SDCC compiler, although I’m not sure whether support for the PIC16 is finished and working already. 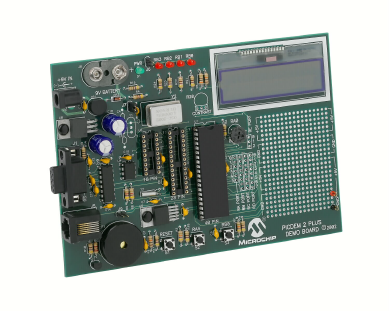 There are other compilers for this controller by Microchip, IAR, Hi-Tech and CSS but either they require a paid license or have a severely reduced free compiler. For now the assembler will have to do, and so I’m working my way through the 170 page manual, but it doesn’t seems to be too complicated. I’m hoping I can use this board as a test stage for that POV display, and as a programmer for the PIC controllers. I asked my boss about those evaluation boards I mentioned earlier, and he allowed me to take the ARM SMDK40100 home to play with. It’s not a gift, it’s just a loan, but I wasn’t hoping for anything more. If they need it back for any reason, they know where it is. I also have a J-Link jtag debugger for the board, but I still need to check whether the connector is wired correctly, but I’m sure it’ll make my programming alot easier if I can get it to work. I’m sure I’ll be allowed to use the PIC controller board too under those same conditions, but for now I’ve left it where it is. I’ve been thinking about that POV project again, and I don’t see me using that ARM board for this to be honest. It’s way too large, and it consumes way too much power. The PIC controller is a much better candidate for that, as I can make that battery operated. I believe I saw a battery operated PIC board/programmer by Velleman if I’m not mistaken… It would an ideal start for that POV project. First job would be to get me a cross compiler for that ARM processor. I know GCC can be made into a cross compiler for ARM, but I also know how much work it is to make your own cross compiler and how important it is to get those versions to match. Second, I should have a deeper look into those Velleman PIC programming kits. 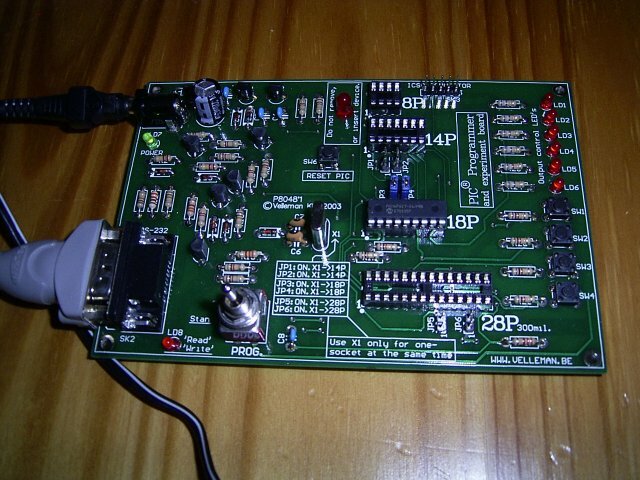 On the account of the rs232 level converter, I haven’t received the samples yet, and I can’t find all the components I need at Conrad and Vael is closed next week. So I’ll only be able to get it going again in April. POV rotating LEDs not dead? The rotating LED idea is now 2 years old, and I haven’t got any further. A while ago I was sorting out the closet in my cubicle which I inherited when a colleague left. And I came across various boards and prototype devices from previous discontinued projects, like satellite locators with a large LCD display, 2-way satellite devices for Interactive TV, and stuff like that. All the way at the bottom of the junk pile, I found two development and evaluation boards. One for a PIC controller we still use in today’s products, and one for an ARM controller. 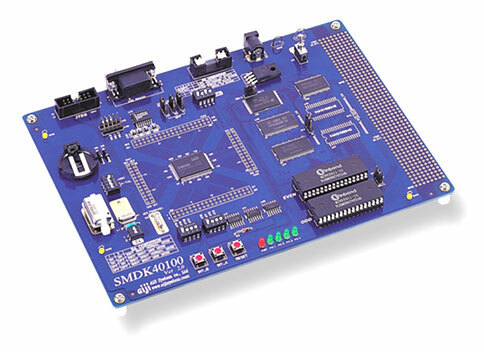 The ARM board is an SMDK40100 development board from Aiji Systems used in the evaluation of the controller and the initial development done for the interactive TV modules. The entire product line has been discontinued for as far as I know, and that 40MHz microcontroller is in my closet gathering dust. Now I think that’s a real shame. There are even JTAG debuggers for that ARM processor in my closet, and no one in the company is developing for ARM any more. A real pity. 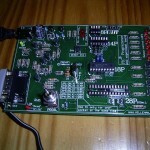 The PIC board is a PICDEM 2 PLUS demo board from Microchip. It is fitted with a P18PTST and a small LCD screen. So I’m gathering my courage to step over to my boss and ask him if I can liberate those boards and give them a new life as light show.